June has been a month of many small but fun things. Farmers market’s, beach days, birthday parties and visits to SF. With long summer days and early mornings I can fit so much more in. Here’s little bit of what I’ve been up to if you don’t follow along on my instagram. I went to an alumni picnic at my school and found this blast from the past picture of some of my girlfriends from my middle school. We look so young! A co-worker invited me to her unicorn birthday party and at the end of it we all walked to 7/11 for slurpees. What a great way to celebrate a really hot day! I’ve had so many to-do things for my apartment that have fallen off my to-do list (coffee-table, console table, hanging artwork, etc!) that my dad came over a few days after I was out of school and we put up these two great pieces above my desk: a picture shelf and my desk organizer. I’m ashamed to say they have been leaning against my wall since purchasing them this past September. Two glorious beach days with friends have already happened and I can’t wait for more. Santa Cruz is gorgeous in the summer! I discovered these great snacks at TJ’s. Yum. I like to walk to Pier 39 in San Francisco. I went up a few days ago and had the best SF weather I’ve ever had, warm and windy but not too hot. What all have you been up to lately? Any adventures? Sometime early last year my friend Kim asked if I wanted to spend my November break with her mom and her family in Mexico. I love relaxing at the beach in the sun, so it was very easy for me to say yes. Fast forward to November and I am on a flight bound for Cancun. They picked me up from the airport and off we went to our condos. They had gotten two back to back and it was such a beautiful location with our own rooftop pools. Kim’s extended family was there, along with her boyfriend Aaron. Our weather was often cloudy in the morning, and would warm up by lunchtime. The sun would stay out until late into the afternoon. Our view was amazing. Up top it was crisp and clear and we could see for a long way. More to come tomorrow! This video was a long time coming, but life just kept on getting in the way. Enjoy! Tuesday morning my dad and I walked down to a local coffeeshop, where we had discovered they made not only an excellent espresso for my father, but a sweet and strong chai for me. Not all coffeeshops have a good chair, so once you find a place, put your feet down and stay a while. The Handlebar Cafe was once of those places. While the interior was charming and comfy, the fresh air and corner garden was where we lounged the most. It had a “secret garden” feel to it with ivy winding around arbors, and small table sets. We spent most of the morning there as my brother slept off his cold. We looked into a few stores, and walked down to the pier where all the ferries take off from. We decided to go to the Brotherhood of Thieves for lunch upon recommendation from our at home neighbor, who is now a second year college student, a far cry from the little girl I babysat and came to this island with so many moons ago. I had a fantastic pot pie (i am picky about having a flaky crust and enough filling) along with a yummy summer salad. 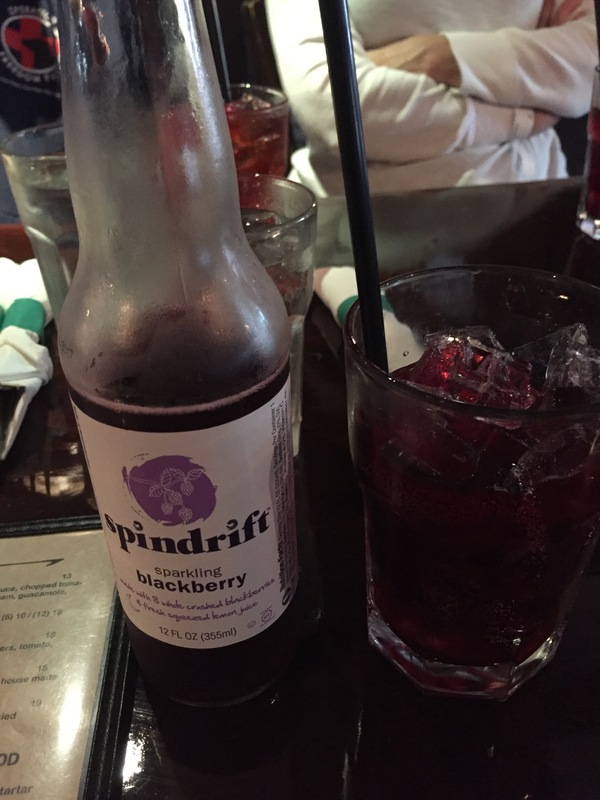 I had never had Spindrift before, so I might have had two of those with lunch! We ended up back at the house with a Redbox movie to watch and enjoyed a mellow evening at the house as a family lounging on the couch. Have you ever had a really good chicken pot pie? Are you particular about the crustiness of your bread as well? I’m so excited for our beach-y week planned next week on Nantucket. Anytime I see a beach day coming on, I get excited, as time at the beach makes me really feel like summer is here! As such, I’ve been looking for a new beach towel. I have one, but it’s looking a little ahem, ratty and faded. There are so many cute ones these day, I might have to spring for a new one! I normally make and bring a tumbler of ice coffee to the beach, but I was reading an article and stumbled upon a fun recipe to make Chai Iced Cubes! and it tickled my fancy. This drinks looks like just the ticket to keeping me fresh and cool on the beach, I might have to whip up a batch and tell you how it goes! Where do you find adorable beach towels? What sort of drinks do you bring to the beach to keep yourself cool?